Yes! I finally did it! Ok, maybe if I had non-homogenized milk the results will be better but nonetheless, it was good enough for me. Here's what happened. Wendy gave a challenge and I took it. This is my 2nd attempt with 2 tries. Both successful. The last attempt I did it 5 times. All failed. For both attempts, I used the same brand of milk. Pasteurized and homogenized. Milk content includes Fat 3.6g/100ml and Protein 3.1g/100ml. This time round, I used old ginger. Yup, I used young ginger previously and have indeed proven that it simply couldn't work. The older the better as the juice is more concentrated and yellowish. This time round, I ensured that there's HIGH impact between the milk and the ginger juice. I poured the milk from a height of at least 10cm, splattering some parts onto the table top. On a side note, there was a Beijing TV clip on this pouring "impact", joking that though it's called 姜汁撞奶 (Ginger Juice Hit/Bump Milk), in actual fact, only 奶撞姜汁 (Milk Hit/Bump Ginger Juice) will work. How corny. And not sure if this helped too but this time round, I measured accurately the amount of ginger juice I used with a weighing scale instead of going by the spoon since I need to pour the milk at one go. Again, I can't use too much milk in this little experiment of mine or else dear Hubby will not have enough milk for his breakfast and I will feel really bad if that happens. So, I stuck to the ratio of 1 portion of ginger juice vs 8 portions of milk and used only 5ml of ginger juice to 40ml of milk with a very small amount of sugar (personal taste). Note: As long as the ratio of ginger juice vs milk is 1:8, any amount should be fine. But do make sure the ingredients are measured first so that you can pour the milk in one swift go. Set aside ginger juice in the ramekin or any serving container. Bring milk to boil and add sugar. Stirring constantly to prevent a skin from forming and milk from burning. Off heat and stir for 10 seconds to cool milk slightly. Pour milk at one go from a height of at least 10cm above the ramekin. The curd should set about 10-15mins and we are done! I'm so glad it worked for you. Haha, So precise use weighing scale to weigh the juice. But I think it doesn't need to be all that accurate, cos every ginger's moisture content is different, some drier, some juicier, so it's just an approximate and anyway 125ml with 15ml juice is almost 1:8. I didn't know about this proportion thingy, maybe I didn't read to many Chinese sites as I read like a snail when I read Chinese and my vocab is crazily limited. I'm so so glad that you got it with a homogenized milk, so that breaks the myth of homogenized milk can't be used. 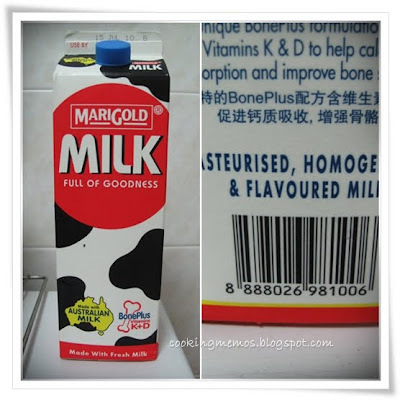 Hmm, so far I've used a few homogenized milk from Malaysia and they all don't work, maybe I'll try Marigold, if I can get it here. But because it's just the same brand of milk, I'm so sorry that it's just one entry for the giveaway. Oh... saw your message too low and I did another experiment today! hi would like to ask, how much sugar to add? Hi Glenn, I only used 1/3 tsp of sugar as we are not sweet tooth. you can add more if you like.